The JOVENTA STANDARD electric damper-actuator series is designed to operate air dampers in ventilation and air conditioning systems. 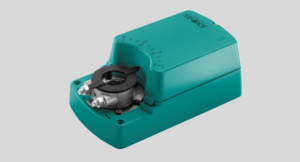 The compact design and universal adapter fitted with limitation of rotation angle make this JOVENTA actuator highly versatile. DAS1 8 Nm 24 V 2 and 3 Point open/close 30 sec. DAS1.P1/2 8 Nm 24 V 2 and 3 Point open/close, with Poti (1KOhm/140Ohm) 30 sec. 20mA, incl. Bourns-Poti 30 sec. DAS2 8 Nm 230 V 2 and 3 Point open/close 30 sec. DAS2.P1/2 8 Nm 230 V 2 and 3 Point open/close, with Poti (1KOhm/140Ohm) 30 sec. 10V, incl. Bourns-Poti 30 sec. DA1 16 Nm 24 V 2 and 3 Point open/close 80 sec. DA1.P1/2 16 Nm 24 V 2 and 3 Point open/close, with Poti (1KOhm/140Ohm) 80 sec. 20mA, incl. Bourns-Poti 80 sec. DA2 16 Nm 230 V 2 and 3 Point open/close 80 sec. DA2.P1/2 16 Nm 230 V 2 and 3 Point open/close, with Poti (1KOhm/140Ohm) 80 sec. 10V, incl. Bourns-Poti 80 sec. DAL1 24 Nm 24 V 2 and 3 Point open/close 125 sec. DAL1.P1/2 24 Nm 24 V 2 and 3 Point open/close, with Poti (1KOhm/140Ohm) 125 sec. 20mA, incl. Bourns-Poti 125 sec. DAL2 24 Nm 230 V 2 and 3 Point open/close 125 sec. DAL2.P1/2 24 Nm 230 V 2 and 3 Point open/close, with Poti (1KOhm/140Ohm) 125 sec. 10V, incl. Bourns-Poti 125 sec. DAG1 32 Nm 24 V 2 and 3 Point open/close 140 sec. DAG1.P1/2 32 Nm 24 V 2 and 3 Point open/close, with Poti (1KOhm/140Ohm) 140 sec. DAG2 32 Nm 230 V 2 and 3 Point open/close 140 sec. DAG2.P1/2 32 Nm 230 V 2 and 3 Point open/close, with Poti (1KOhm/140Ohm) 140 sec.